Arkansas – A group of Freemasons in Southwest Arkansas has launched a new website online to share lodge meeting dates, events, and other important information. 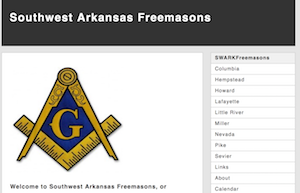 The site is called Southwest Arkansas Freemasons and can be viewed online now. The site currently includes the counties of Columbia, Hempstead, Howard, Lafayette, Little River, Miller Nevada, Pike, and Sevier. The site has some history of the county when possible and history pertaining to each lodge if it has been provided. The website manager stated that information would have to be provided from some lodges, including pictures of the lodge and contact information in the near future to update the page. The page is expected to be modified on a regular basis to include fundraisers and other events for each lodge represented. To learn more about Freemasonry, visit the Southwest Arkansas Freemasons site at SWARKFreemasons.com or review the links page found on the site and visit other Masonic organizations in the state.